One of my biggest hesitations with making my own jeans is that I really, really, really love that comfy, faded and broken in jeans look. And you just can’t get that right off the bat with jeans you made. 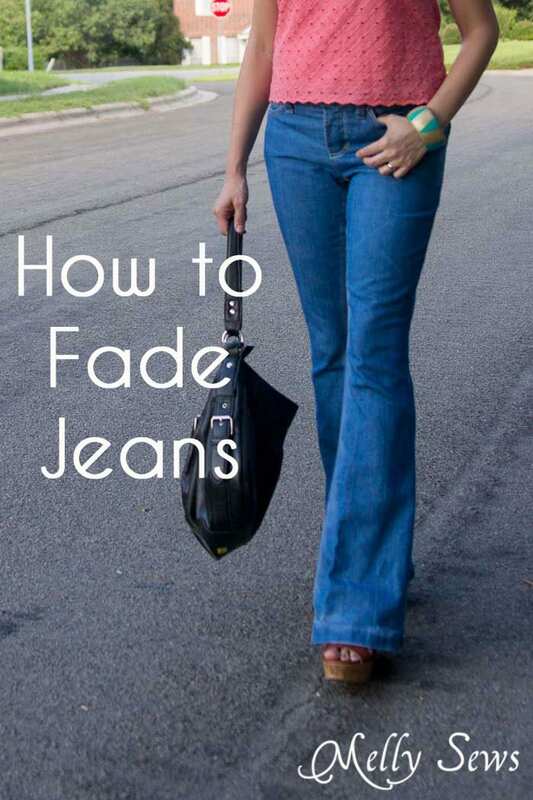 So today let’s talk about how to fade jeans. First, it’s important to understand a little bit about why jeans fade the way they do. 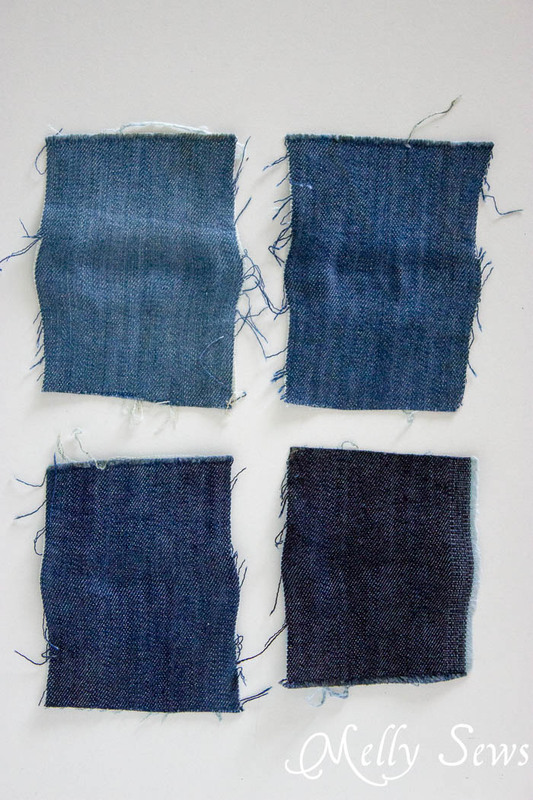 Indigo dye, which is used to get that distinct color, bonds to thread differently than other dyes. Indigo is a specific chemical that colors the fiber through oxidation, which is not the process for other dyes. Because of this, it can also be rubbed off (ever had new jeans turn something blue?) as well as fade over time as it gets washed. That oxidation also means that things that might fade other fabrics don’t work well with denim. For example, this color remover worked to turn the water blue because it broke those chemical bonds between the indigo and the fiber, as you can see by my blue sandpaper and my blue spoon. However, as soon as you pull the fabric out of the chemically treated water, guess what happens? Oxidation. So the dye rebonds to the denim and pretty much doesn’t wash off. Above, left to right – sample treated in color remover, control (untreated) sample, and the treated sample that I rubbed with sandpaper. 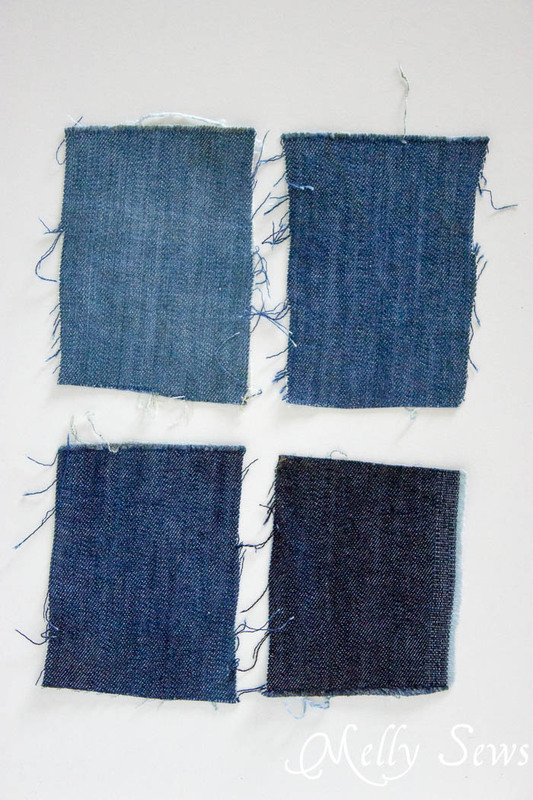 You can also see from the samples above that when the indigo reoxidizes, it can bond to the white threads in the denim, and appear even darker than the original sample. Moral of the story – this won’t fade your indigo dyed jeans. 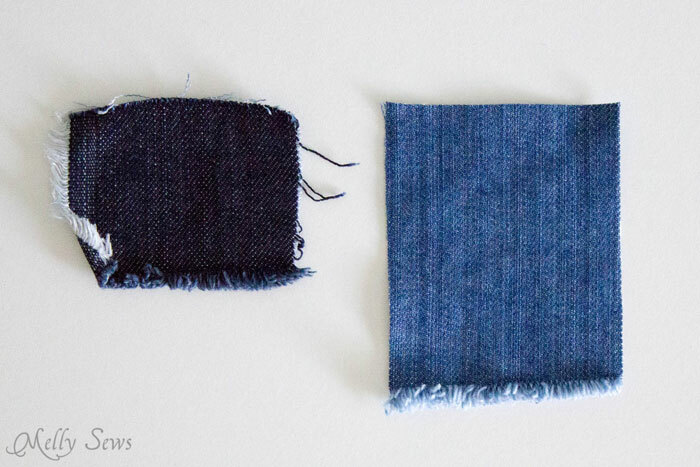 Manufacturers speed up the fading process using enzyme washes that break down the fibers (and therefore their color) but these aren’t available to consumers. So what works? Bleach is the most widely available chemical that will react with indigo to remove it from fiber. All those stories on the internet about using lemon juice, coffee, salt, etc? Yeah, those don’t work. So I decided to do some bleach testing on denim samples. All of these samples in the photo above were left in bleach for 15 minutes, then rinsed and soaked in hydrogen peroxide (more on that further down) for 15 minutes before drying. From left to right, top to bottom: 1/4 bleach, 3/4 water; 1/8 bleach, 7/8 water; 1/16 bleach, 15/16 water, control sample. 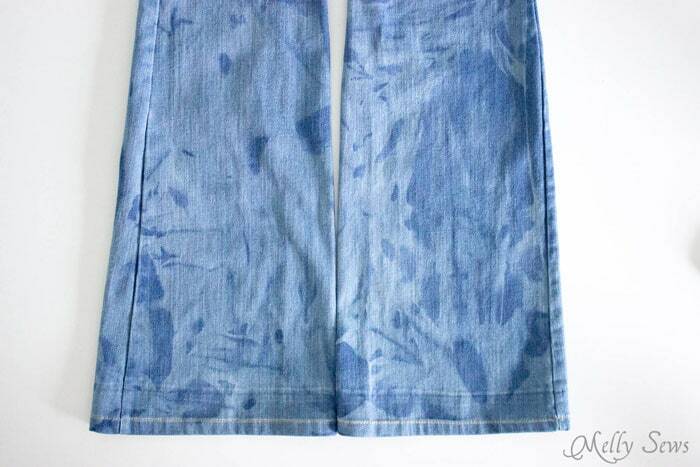 As you can see from those samples, bleach is very effective at fading indigo dyed cotton. But there are a few problems. The first, is that most of the jeans we wear and make have some synthetic fiber in them for stretch. And bleach destroys synthetic fiber. Check the same samples below, after I stretched them. See how the longer the fabric spent in bleach, the less stretch recovery it had? Bleach damages cotton too, in that it keeps reacting with the fiber even after you rinse and wash it out. So you need to deactivate the bleaching action. The simplest way to do this is to soak the fabric in hydrogen peroxide for at least 15 minutes after you rinse the bleach out. And yet another drawback? If you leave your fabric sitting and walk away, you can get very uneven bleaching. See example below. 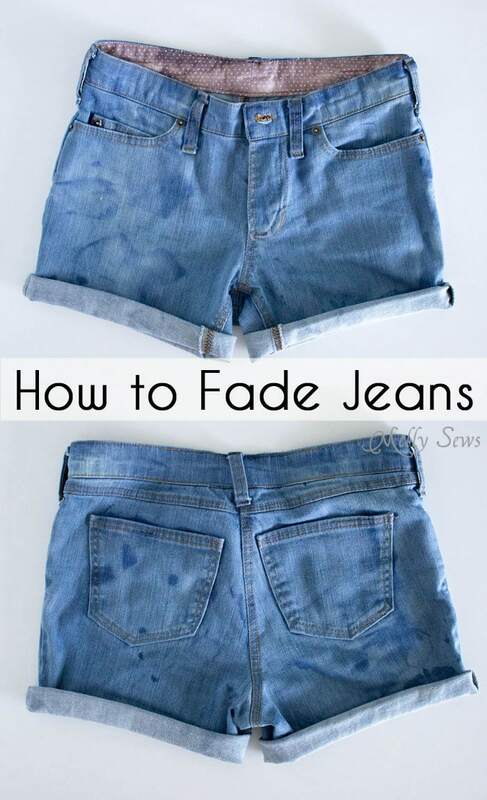 While that bleachy, streaky look may not work for you, I did like how it worked as a pair of cutoffs. Because the bleach reacts a little different with each fabric, my samples above may not apply to your specific denim. But my advice would be to use the smallest concentration of bleach (1/16) and wear gloves and submerge the fabric totally and stir constantly while you watch the color. 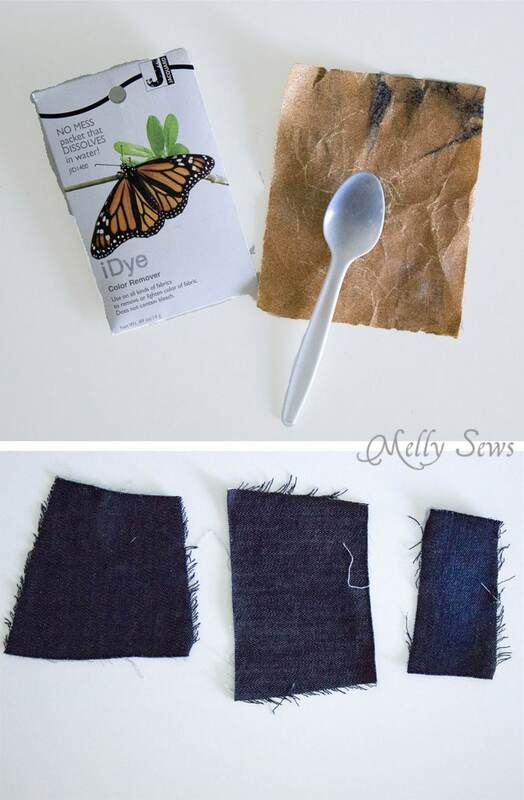 The wet denim will be 2 shades darker than it will be when dry, so take the fabric out before it gets as light as you want. I also recommend bleaching fabric before you cut and sew your jeans. 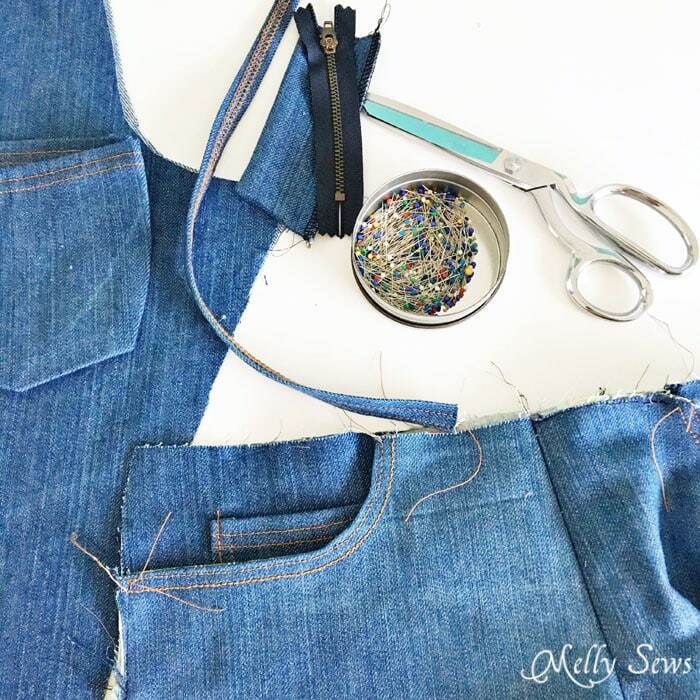 That gives you a chance to cut around any streaky spots and also lets you check for stretch recovery and adjust your pattern accordingly (like you might want to go down a size if you jeans are going to stretch and stay stretched). The denim above is a sample from Pacific Blue Denims and it lightened really quickly. I submerged it in 1/16 bleach water for about 5 minutes before pulling and rinsing. And below are the jeans in progress. And my finished jeans – I also used a q-tip dipped in 1/4 bleach solution and ran it along the edges of the seams and hem before washing my jeans one last time. IF you do this, USE A LIGHT TOUCH! You can always bleach more later, but you can’t add color back and have it look the same. These jeans are another pair of Ginger Flares. 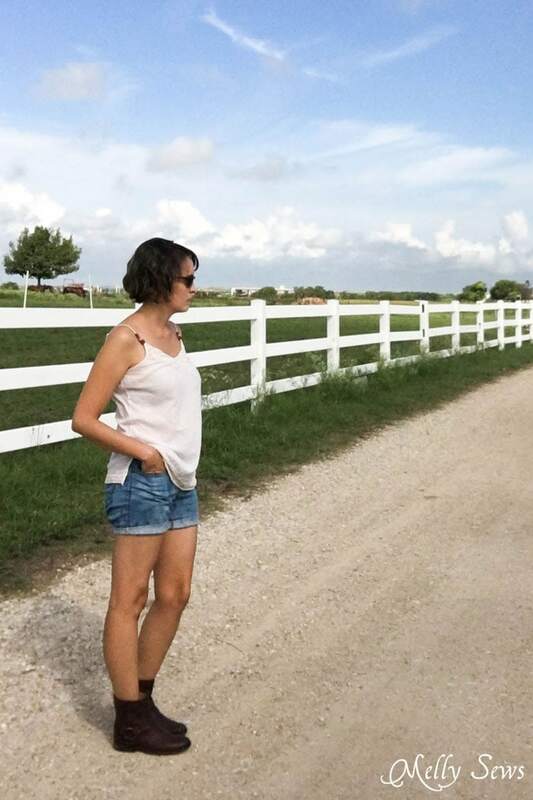 I made them with denim that Pacific Blue Denims sent me, and I think I will be using them for all my future denim needs because this stuff is sooooo nice! This time I did a size 4 jeans everywhere but the front thighs – I went up to a 6 there, reasoning I could take the jeans in if I needed to. But they’re just right for me like this. I also only took the flares in 1/2 an inch each this time, and I think that was the perfect amount. But darn it, I’m still not good at estimating how much vertical shrink will happen. I only cut off 1 inch this time, and used 1 1/2 inches for the hem, and they’re still shorter than I wanted by about an inch. On the bright side, they’re the perfect length for low heels, just not these super high wedges. They’re still not quite as washed out and vintage faded as I wanted, but I think doing any more will cause more damage than it’s worth. I’ll just have to practice patience. So – in summary – if you have the patience, it may be better to just wash and wear your jeans often to speed the fading process if you want the best results for faded jeans. If you don’t, bleach it is. But beware that it could end up streaky or damage your fabric. And always bleach less than you think you’ll need to. Those jeans are totally perfect! Very cool to see the different outcomes from different bleach concentrations. Thanks for doing the science for the rest of us! Thanks for the tutorial! I’ve faded denim before using bleach, but was quite unhappy with the results. I ruined the first pair by using so strong a concentation that it ate such large holes, the pants were ruined. I realize now I could have patched them, but it wasn’t the style back then and I threw them away, disgusted with my failure. These days, I make use of accidents, adjust my plan and carry on without fretting over failures. Traditionally, hem length for women’s pants with a normal width leg (not wide like these or narrow) was supposed to just barely touch top of mid-foot or hang very slightly above it, so from the pictures, they look over long to me. 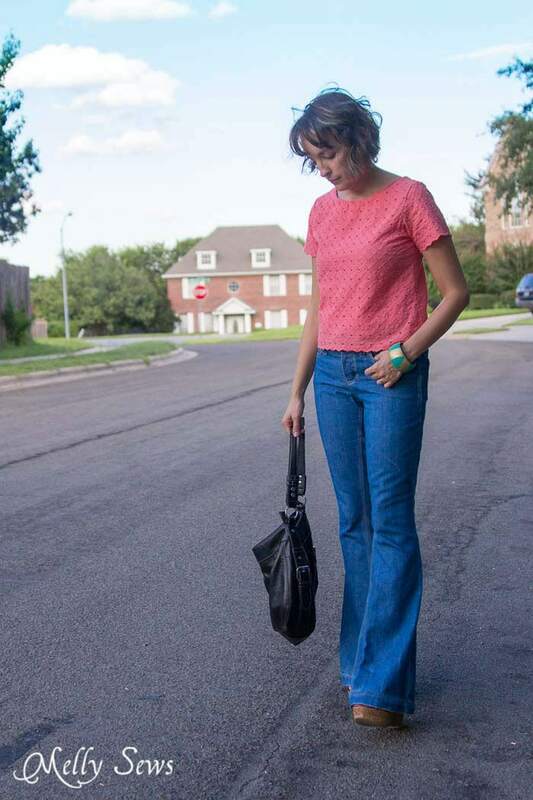 I went and looked at a few fashion blogs about current pants lengths and it appears that the accpetable length for women’s wide leg jeans is far longer than it has been in previous decades, so I can understand why you’d want them to be yet longer. You could add to them. If the folded-under hem portion is long enough to equate the extra length you need, you could un-hem, add a piece of denim or lighter weight fabric, using only a 1/4 serged seam, fold the new fabric under at the new seam to hem. Depends on if you bleached the edge of the hem already.